Jilin University is entrusted by the Education Ministry of China as one of the institutions to award Chinese Government Scholarships to international students for the academic year 2019. Jilin University is one of the key research universities under the direct aegis of the Education Ministry of China. The university ranks among the top 10 in China and top 500 in the world. It is the largest university in China. The university sincerely welcomes all outstanding international students to come to JLU, pursue their education and conduct research work. Applicants must be non-Chinese citizens in good health and not studying in China at the time of application. Applicants for Doctoral degree studies must hold a Master’s degree and be not older than 40. Accommodation of the international students shall be arranged by the university in the first year. The student will live at the campus dormitory. In principle, master’s degree students live in double rooms, doctoral degree students live in double rooms while they are studying Chinese Language and single rooms when they start their major study. 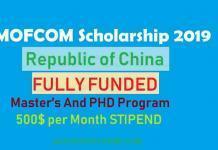 Application Form for Chinese Government Scholarship. which can be downloaded from the link below. Copy of passport information page. English level certificate (Internationally accepted). The photocopy of the papers which has been published on international journals（Selectively provided）. Self-introduction video（3-5min，please submit with CD or USB, do not accept mail version）. Please submit all the materials (two copies for each) in the order as listed above; only the materials mentioned above are required. Blurry or incompletely filled materials will not be accepted and all materials will not be sent back to the applicant, admitted or not, please understand. Jilin University need to receive your application material before March 31, 2019, after this date we will refuse to handle your documents.